RunBook Automation enables DevOps to standardize their operating procedures, into well-defined run-books. These run-book definitions can be stored in text file and checked into version control of your choice. Later these run-book steps can be executed across one or more servers using DivineCloud RunBook Orchestrator. RunBook abstracts away the complexity of installing the product, and instead presents a simple Input form for users to provide answers, and that's all the users need to do to install the product. The self-documenting feature of RunBook makes it very easy for advanced users to look at the RunBook and make sense of it. It's like having the installer and the Install Guide both blended together and made available to their users. Commands & scripts that need to run frequently can be saved , and can later be re-loaded for re-execution. DivineCloud provides a central repository for storing all the command and scripts in single place. 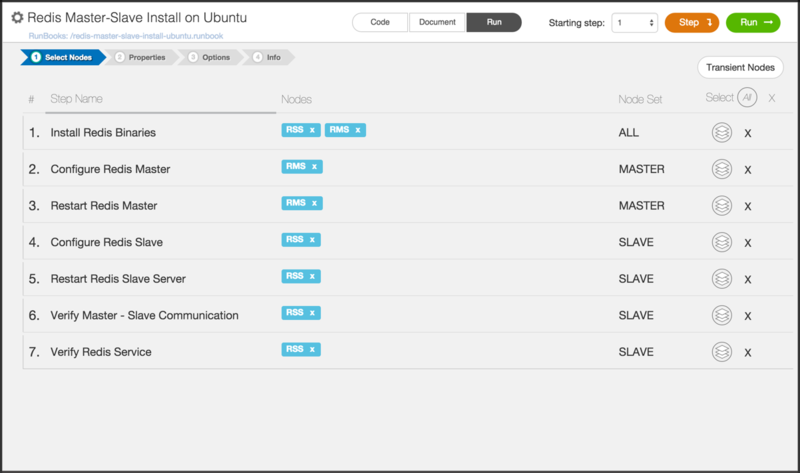 Users can choose to save the commands and scripts on their local file system and manage/share the commands & scripts with other peers. This also acts a very good version controlled configuration repository for DevOps. 1. Select one or mode Servers on which the command/script needs to be executed. 2. Type new command/script or select previously saved command/script. That's it, the UI will start streaming the output for each servers in real-time. Also the complete statistics, showing how many servers execution was succesful vs failed vs not-reachable is displayed to user. Booklets make it possible to execute any complex task using one-click. The DevOps team can create booklets for any task as simple as installing tomcat server to as complex as creating new AWS VPC along with Subnets, NAT, IgW & desired EC2 instances. Once the booklet is created users can execute the booklet with just one-click, thereby not having to deal with any complex configuration steps from their perspective. 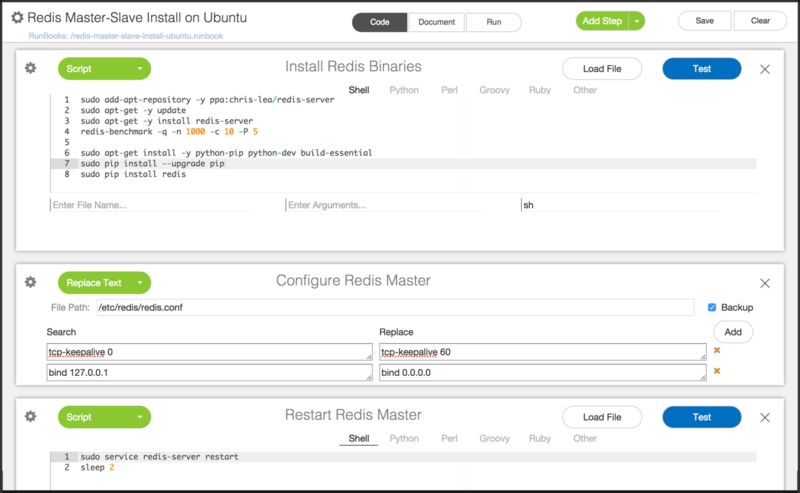 Let's look at the REDIS MASTER - SLAVE INSTALLATION BOOKLET in the figure above. 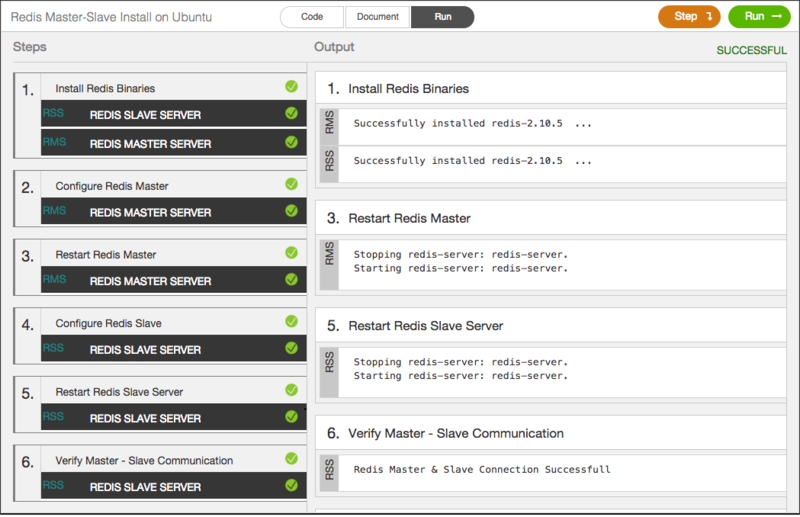 All the user needs to do is click the Run button, and a complete Redis Master / Slave cluster is installed and configured for the user. This provides a very powerful ability for DevOps team to hide all the complexity from their users, and only provide a simple UI for them to work against, thereby increasing productivity, saving time and reducing user errors in the process. For most scenarios, DivineCloud Community Edition is a best fit. 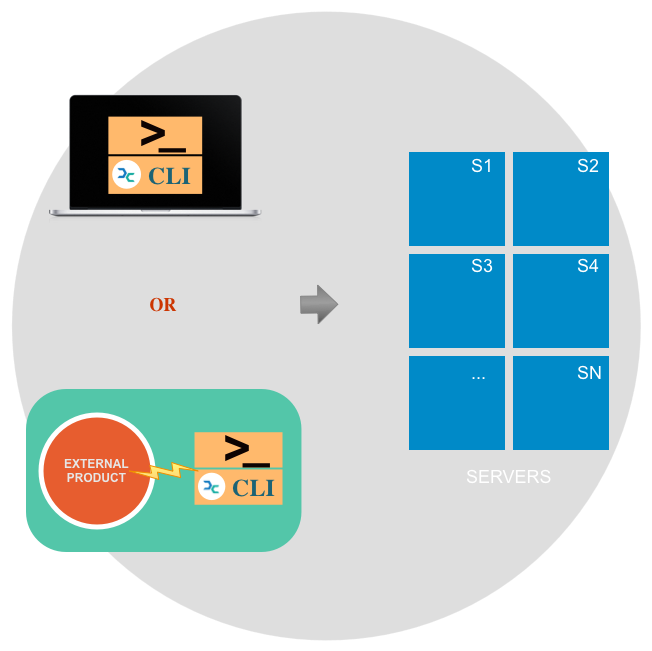 However for few scenarios where users want to trigger command/script/run-book execution through external products, the DivineCloud CLI is a better option to go with. DivineCloud CLI is available as a zip file with no dependency on external DB. It can be included in the same package or on same system as the external product, and can be triggered by the external product, just like any other system command. 1. Install the DivineCloud CLI package and directly call it from the system terminal. 2. Install the DivineCloud CLI and invoke it from external product installed on the same system. Additionally, DivineCloud also provides a Java SDK, so users can directly invoke the DivineCloud Java API for executing commands/scripts/run-books across multiple servers in parallel. The complete Java codebase is available on GitHub. 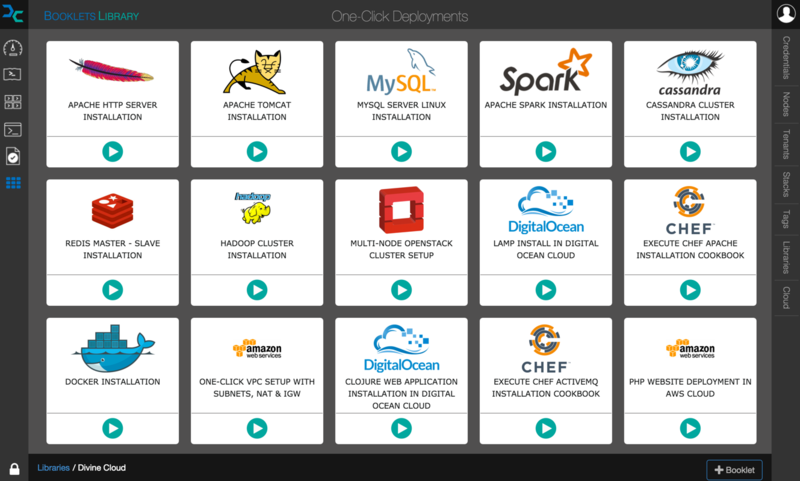 Using DivineCloud is simple - zero learning curve required. Within few seconds, DevOps can execute commands, Scripts & RunBooks across 100's of servers in parallel. DivineCloud uses SSH to communicate with servers, so Agent installation is NOT required. 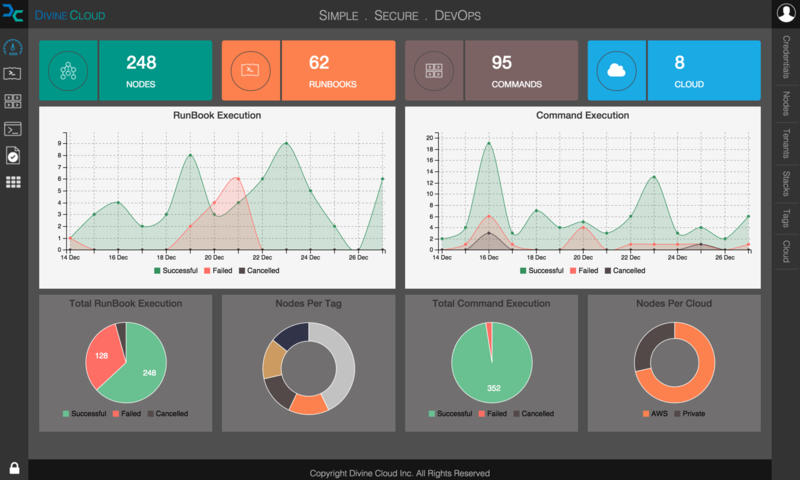 In matter for few minutes, DivineCloud can be installed on DevOps laptop or server, and ready to use. Write the deployment Scripts & RunBooks in language of your own choice, including Shell scripts, Ruby, python, perl, etc. and execute them across multiple servers seamlessly. Users can group servers by tags and/or stacks. Later user can use tags to filter servers associated with those tags. 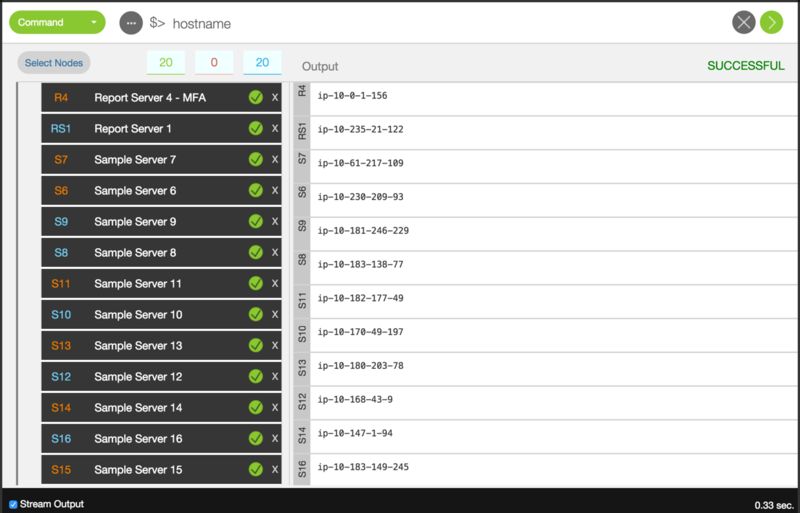 Central access to inventory like Nodes, Credentials, RunBooks from a single UI Pane. Divine Cloud has built-in support for multi-tenancy providing complete isolation across each tenants. DivineCloud provides significant time savings in managing 100s or 1000s of servers distributed across hybrid cloud environment. Access & Manage servers (Physical or Virtual) located anywhere on public cloud like AWS, Digital Ocean, Rackspace, Joyent, Google, etc. or inside your own private data centers.